Back in January I alerted you to the hotel construction boom that's bringing SF four new hotels this year, three of which appeared to be arriving with rooftop bars  an exciting bit of news for a city that's historically very short on rooftop drinking options. Well, now we have confirmation about one of those that was unconfirmed, as well as the operation behind it. As Curbed reports, the previously unidentified hotel project at 250 Fourth Street (at Folsom) is going to be the second US property for Virgin Hotels, Sir Richard Branson's hospitality chain. And yes, that rooftop bar will be open to the public once the place opens next summer (2017). 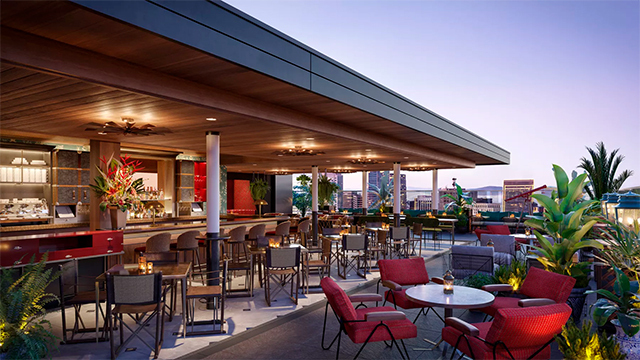 Curbed first hinted at Virgin's entry into the SF scene last year, and now gets further details via press release, as well as the pretty rendering of the rooftop bar below. The new Virgin Hotel will include multiple cocktail bars, apparently, and a restaurant  an extension of The Commons Club, the restaurant in the chain's Chicago property. Also, there will be a coffee shop, and 196 guest rooms, including "master suites." This new Virgin property is joined by several others, at least a couple of which should open by year-end, including the San Francisco Proper Hotel at the former Hotel Renoir near U.N. Plaza, opened by Brad Korzen and Brian De Lowe  the former executive team behind Viceroy Hotels  which is also set to include a Kelly Wearstler-designed rooftop bar and ground-floor restaurants. As Inside Scoop notes, Virgin Hotels has a Silicon Valley outpost also on the way in 2019.